Countless eye injuries could be prevented every day if more Americans wore prescription safety bifocal eyeglasses. People who need prescription eyeglasses in order to read often make the mistake of having one set of frames for vision protection and and another for vision correction. One pair of glasses can offer both magnification and protection, while also addressing both farsightedness and nearsightedness. Protective bifocals, known as safety readers, have a prescription magnification only in the bottom half of the lens; the lower half of the lens corrects short-distance vision, and the upper portion has no correction. Some protective bifocals correct long-distance viewing in the top half of the lens and short-distance eyesight in the bottom half. With both types of bifocals, the wearer doesn't have to change glasses in order to read. Not surprisingly, safety readers are much more affordable than protective bifocals that have prescriptions in both the top and bottom halves of the lens. Safety reader frames usually don't wrap all the way around the lenses, and sometimes the lens portion is actually just one piece that wraps around the face. The frame and lenses are molded to fit the face snugly and protect the eyes from all angles. Tinted safety readers can protect against up to 99 percent of the sun's ultraviolet rays. There's greater availability of safety readers with lower magnifications, typically in the range of +1 to +2.5 . Lenses with stronger magnification need special ordering and typically cost a lot more. You can find the lower-strength safety readers in many hardware stores and building supply outlets, while you'll have to seek out specialty optical retailers to find stronger safety readers. Galveston: Protective eyeglasses are just one of many types of safety-related products for sale on this site. 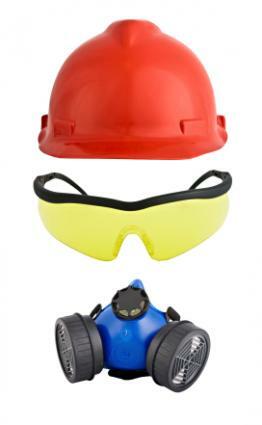 The company has its own brand of safety eyewear. Polarized Safety Glasses: Bifocals count among the tinted protective glasses selling here. Safety Glasses: Over a dozen different brands of protective bifocals are available on this site. Safe Vision: Bifocals are a nascent category on this safety eyewear website. AKO Safety: All eyeglasses include coatings to protect against fogging and ultraviolet sun rays, and many models also have adjustable lens angles and temple fittings. Crews: This company offers protective bifocals for every type of work environment, including low-light conditions. Elvex: These safety bifocal glasses come in a wide range of models. Optx: This manufacturer's latest offering is a set of stick-on bifocals that you can temporarily affix to a pair of safety gasses whenever needed. These removable bifocals, called Optx 20/20. Prescription safety bifocal eyeglasses are affordable, durable and widely available, so there's no reason to forego having both vision protection and correction.